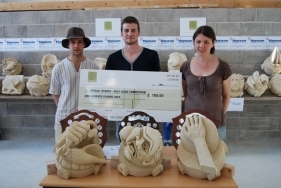 Over thirty trainee stonemasons took part in the annual ‘Boss Stone' competition at Dorset Skills Centre on from Wednesday 23rd May till Friday 25th May with a 2012 Games inspired theme. The overall competition took place over two and a half days at the Weymouth College site in Poundbury with level 1, 2, 3 and foundation degree students and apprentices in with a chance of winning one of three categories, with a £100 prize for the overall prize winner sponsored by Daedalus Conservation. The Overall winner was Dan Owen, a first year, Diploma in Stonemasonry level 2 student. Dan said: "My inspired piece was a combination of the Olympic sport, shot-put with features you'd see in a cathedral – gargoyle like. I worked well with the stone and I am very pleased to have won the overall prize. My plan for the future is to move back to Wales and start up my own company." The first year winner, Alistair Mason, Diploma in Stonemasonry, level 2 said the imagery was of a symbolic fist from the Mexican Olympics from 1968, holding a medal, and he incorporated seashells and pebbles into his design which were symbolic of the Jurassic Coast. The second year winner, Maya Marten, Diploma in Stonemasonry, level 3 chose discus-throw as her inspired Olympic sport as she loves the famous statue of Hercules holding a discus. Now in its eighteenth year, this highly regarded annual competition ended on the Friday 25th May with one student winning the overall prize of £100 and two others winning £50 each along with an awards shield. The rectangular blocks of stone were donated by local businesses; Hanson Bath and Portland Stone Firms Ltd, with the 1st year prize and 2nd year prize and overall prize sponsored by Daedalus Conservation.